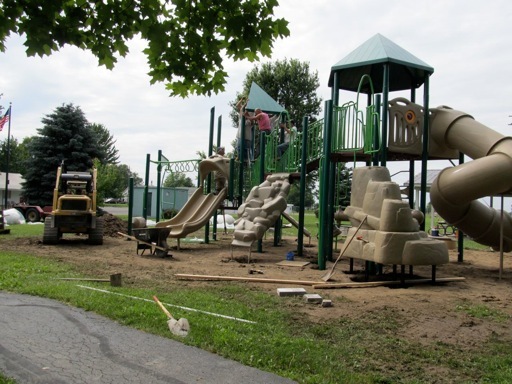 VILLAGE PARK PLAYGROUND INSTALLED & READY FOR PLAY! The new park playground has been in the planning for several years and is finally installed and ready for kids! The new playground is state of the art equipment that is designed to be durable and able to handle lots of kids safely. Neighborhood kids were ready to play on the equipment the minute it was installed but were told they had to wait patiently for a couple days before using it! The Mt. Victory Village Park will be alive this summer with additional activities including construction and installation of a new basketball court, ball diamond, lights and renovation of the community building (sportsman’s building) including new ADA restrooms as well as new park entrance signs. We all know parks and rec areas are an important part of every town. They boost community spirit and the local economy – they provide aesthetic and recreational benefits, they enhance properties, increase municipal revenue, create safer neighborhoods, and promote public health. Parks bring in homebuyers, workers, and attract retirees. Our town park is one of our most important assets – realtors note that when people decide where to buy a home, they want to live in a town that provides outdoor rec activities from walking paths to playground, ball fields to ball courts. Workers who are attracted to the area put money back into the local economy through jobs, housing, and taxes. Business owners looking to relocate their business include parks in their check list of ‘must haves’ in order to help retain good employees. The bottom line is that parks are a good investment for a community. Understanding the economic impacts of parks can help decision makers better evaluate the maintenance and long term planning for our town park. Beyond all the numbers, our park is a place of FUN. Where kids can run, jump, play, learn and spend time with family and friends. This is the place where we all can have fun with each other from youth to seniors – where photos are taken and memories are made. We have LOTS to do and if you would like to help out by donating any amount (no amount is too small) it would be very much appreciated! Donate online or watch for a mailer coming to you soon!